1 Name a step free station on the London Overground Network that is NOT served by a Tube line. Sorry for extreme pedantry on my part but some clarifications please - numbers relate to the quiz question. 2. do you mean a type introduced into passenger service on the bus network or do include the tube as well? 3. what is a "London Transport bus type"? Designed by LT? Built by LT? or just any bus that had a LT style class code even after bus company privatisation? 6. Can this refer to any garage, including those closed and demolished, that has ever operated route 12 including when route 12 was a much longer route than today? 7. Again I assume this means a bus route that was branded and operated as "Red Arrow"
8. Again does this apply at any point in LT's history? i.e. after 1933? 9. Again is this question unconstrained by time? 10. Do you mean operated on a regular scheduled basis or any route that saw them used including unscheduled workings? I assume 'rat' in question 4 was a typo? Sorry, I've not seen this quiz before so I didn't know how it works. I have now deleted my answers. Who do I PM to? The Quiz has now closed. Q1 Name a step free station on the London Overground Network that is NOT served by a Tube line. Loads of alternatives too many to list. Q2 Name a vehicle type introduced by London Transport in the 1970’s. 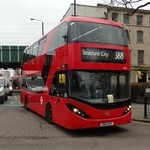 Q3 Name a London Transport bus type used on route 68 before 2015. Q4 Name a route that operated BL vehicles. plus they often strayed at EW covering defective SMS vehicles here is BL31 on the 240 as shown below. Q5 State a current TfL route that crosses Battersea Bridge. Q6 Name a Garage that has operated route 12. Q7 Give a route Number that has been used as a “Red Arrow”. Q9 Name a route that has been operated with single deck vehicles from TH garage. Q10 Name a route that operated FS vehicles. Ah well proof positive again that I'm completely useless at these quizzes.